IOC Backs Ban Of Russia's Track Team, But Leaves Door Open For Athletes : The Two-Way International Olympic Committee President Thomas Bach says individual athletes will have chances to prove that they're "clean," in the face of doping allegations that have embroiled the Russian team. International Olympic Committee President Thomas Bach says there's still a way Russian track athletes could compete in Rio this summer. He's seen here at a news conference in March. An umbrella meeting of some of the most powerful people in international sports has "unanimously agreed" to respect the decision by track and field's governing body to ban Russia's track and field athletes from the upcoming Summer Olympics — but it also left open the possibility that some of those athletes could be cleared to compete in Rio. 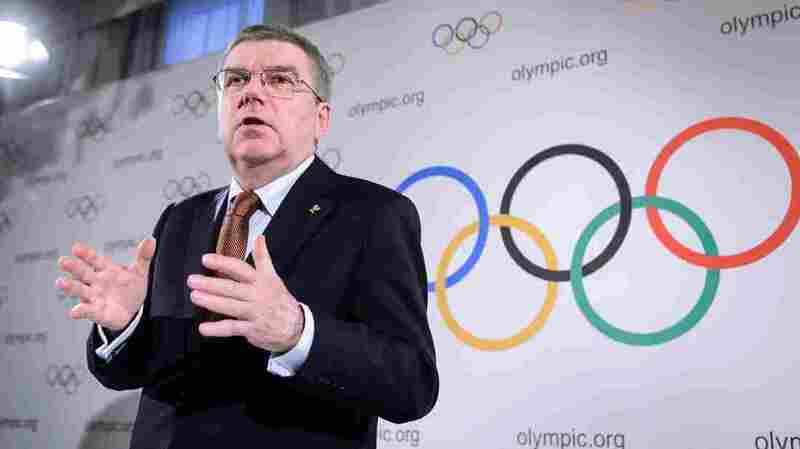 Led by International Olympic Committee President Thomas Bach, the Olympic Summit group stated its full support for the way the International Association of Athletic Federations handled the far-reaching doping scandal that has embroiled Russia's track team. But the wording of the summit's decision also immediately led to speculation that Russia's track and field athletes might be able to compete if they're approved on an individual basis. Today, Bach seemed to contradict the latter part of that stance, saying that individual athletes who are found to be free of performance-enhancing drugs may be able to compete under the Russian flag. After several reporters at Tuesday's news conference asked for a clarification of the IOC's stance, Bach described how athletes compete for their national Olympic committees, not for the sports federations. "When it comes to the Olympic Games," Bach said, "all athletes then are part of the team of the Russian Olympic Committee, and this is a different situation." Asked again to clarify that statement, he said, "Contrary to the national federation of track and field, the Russian Olympic Committee is not suspended." Bach also suggested that athletes from countries found to have doping problems — Russia and Kenya, in particular — could face more scrutiny than those from other countries. The summit's declaration states that the Olympic group "considers the 'presumption of innocence' of athletes from these countries being put seriously into question." As for the possibility that qualified Russian track and field athletes who pass doping scrutiny might compete in Rio despite the blanket ban on Russia's track federation, Bach said, "We still have to wait ... for the individual decisions coming from IAAF." From Moscow, NPR's Corey Flintoff reports, "The head of Russia's Olympic Committee said Russia will not boycott this summer's games, but may take legal action to get its track team reinstated." For the Olympic Summit, Bach was joined by representatives of the national Olympics Committees of Russia, China and the United States, as well as IOC board members representing athletes and sporting federations.